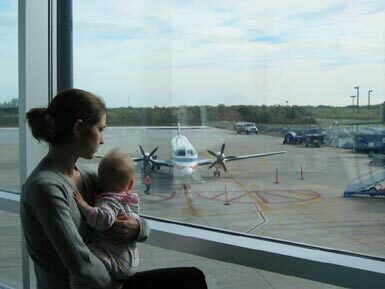 Will Daddy be able to get on the plane? You know all those vets coming back from the Iraq and Afghan wars with Post Traumatic Stress Disorder? They'll be thrilled to learn that they have been fighting for the right of the Transportation Security Administration to ban them from airplanes. That's right -- a new (?) category is being added to the no fly list. A Nov. 15 notice put out by the Transportation Security Administration (TSA), . . . states TSA is looking for contractors to add a number of new databases for screening passengers and airport workers. Up first are the files of the Defense Department (DoD) and Veterans Administration (VA), which the TSA says it wants scoured for “mental defectives.” . . .
Just to complicate things, the Veterans Administration says it has no "mental defective" category -- unless maybe it does. Yesterday I heard Tom Blanton of the National Security Archive speaking with Terry Gross on NPR about how the Bush administration has worked to gut the Freedom of Information Act. He explained that the largest category of FOIA requests was from vets trying to get their service records -- apparently veterans have to fight for years to correct incomplete and incorrect personnel information. Now they'll have one more impediment to normal life to worry about on coming home. Hat tip to Suburban Guerilla for the latest no fly info.